Bring your garage into the 21st century with our newly redesigned, Performance Plus 2.0 Series; our first fully mobile, modular garage cabinet series yet! Each cabinet features fully welded, 18-Gauge steel frames with fully lockable double-walled doors; that's 100% stronger than our Performance Series! We've included soft-close door hinges, adjustable steel shelving, full extension drawers, integrated top tool trays on your base and tool cabinets and many more premium features. Our newly designed Mobile Spacer Kit allows you to change your once static garage set into a fully functional mobile set; with included casters, your base and tool cabinets can now slide in and out of your set with ease, leaving your worktop stationed. This redesigned Pro Series line boasts cabinets that come fully welded with minimal assembly required. The multi-use locker comes with four easy-to-adjust shelves in 1-inch increments, with each shelf having a 300 lb. weight capacity. 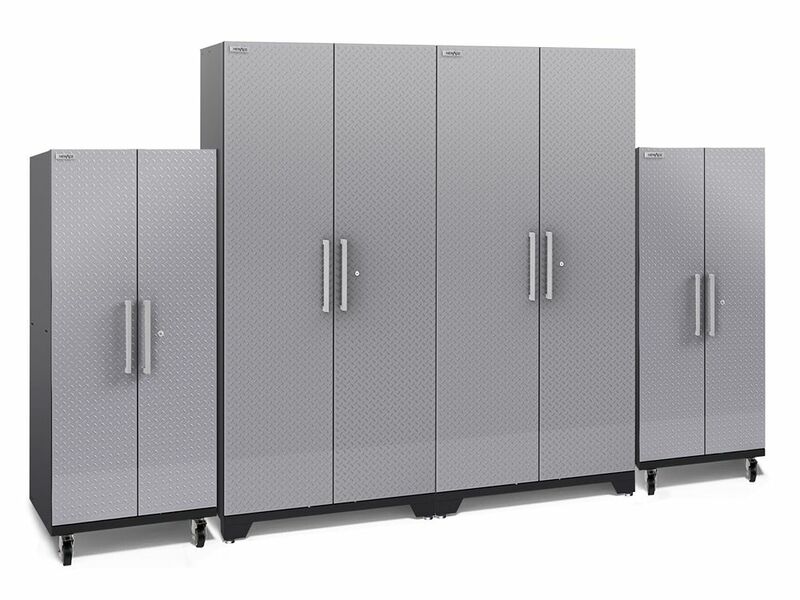 The new 19 gauge steel double wall door design offers full length anodized aluminum handles, with a full length locking system that secures the doors at both the top and the bottom of the locker frame. All models come with levelling legs, or you can choose to mount the cabinets to the wall. Get all those cables, decorations and gardening tools off your garage floor and into NewAge' newly redesigned, Performance 2.0 Series modular garage cabinetry. These cabinets are built to last with their fully welded, 24-Gauge steel frames and fully lockable, double walled doors. Our configured sets are shipped with adjustable steel shelving; easy-to-grab stainless steel handles and height adjustable levelling legs that accommodate uneven garage flooring. The manufacturer's limited lifetime warranty gives you the insurance that your cabinets will look great for years. Performance Plus Diamond Plate 2.0 Garage Cabinet Set in Silver (4-Piece) Bring your garage into the 21st century with our newly redesigned, Performance Plus 2.0 Series; our first fully mobile, modular garage cabinet series yet! Each cabinet features fully welded, 18-Gauge steel frames with fully lockable double-walled doors; that's 100% stronger than our Performance Series! We've included soft-close door hinges, adjustable steel shelving, full extension drawers, integrated top tool trays on your base and tool cabinets and many more premium features. Our newly designed Mobile Spacer Kit allows you to change your once static garage set into a fully functional mobile set; with included casters, your base and tool cabinets can now slide in and out of your set with ease, leaving your worktop stationed. Performance Plus Diamond Plate 2.0 Garage Cabinet Set in Silver (4-Piece) is rated 5.0 out of 5 by 2. Rated 5 out of 5 by AntB from high quality cabinets These are incredible cabinets and very heavy. They are by far better than Husky, Kobalt, and Craftsman. The cabinets are sturdy and very well built. They were so nice we bought 2 more. Rated 5 out of 5 by Benzo from Cabinets I ordered these cabinets about a month ago. First off, I was surprised on how fast they shipped and arrived at my house. The only assembly were the wheels and legs, hanging the cabinets was easy and fast and they look beautiful and have plenty of storage space. They are excellent.